Eye cancer is a very rare malignant tumor, but people still need to pay more attention to it. Eye cancer experts of Modern Cancer Hospital Guangzhou point out that, once diagnosed with eye cancer, patients shall never be caught up in panic, but promptly go to the regular hospital for treatments. 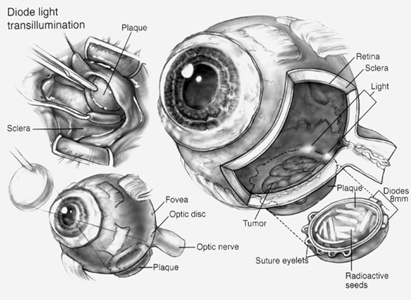 Surgical operation excision is the most commonly used method for the treatment of eye cancer. If canceration is limited to the nictitating membrane, full extraction operation from the root of nictitating membrane shall be carried out; if canceration is occurred in the conjunctiva and has not yet invaded into deep tissues, then wide scale excision shall still cover the surrounding tissues, meanwhile, the part closed to the nictitating membrane area is also removed; if canceration occurs in the surface of eyeball, then careful consultation shall firstly be carried out and then decide the operation of full eyeball excision; if canceration has invaded into eyeball and the orbit, it is necessary to remove all tissues including margo palpebrae and its surrounding skins, muscles and connective tissues, etc. Appling x-ray, γ-ray, cable and electron beam to irradiate cancer tissue can maximally kill cancer cells and destroy tumor tissue. Chemotherapy applies chemical drugs to kill cancer cells or inhibit cancer cell growth or reproduction. Selective application of chemotherapy prior to or after operation can increase therapeutic effect of operation and also improve the quality of life of patients with eye cancer. Chinese medicine treatment can be run through the whole treatment course of patients with eye cancer: it can strengthen the body resistance, regulate respiration and circulation system and enhance immune function; it can be used alone or combined with operation, radiotherapy, chemotherapy, etc. ; it can inhibit tumor growth and improve the life quality of the patients. In different period, eye cancer treatment shall also take different approaches. Eye cancer experts of Modern Cancer Hospital Guangzhou point out that, because the traditional single treatment'effect is relatively weak, therefore, eye cancer experts of Modern Cancer Hospital Guangzhou would also apply combination of minimally invasive treatment technology with interventional therapy, radioactive particle implantation, etc. as per patients' actual conditions, so that achieve better therapeutic effects.